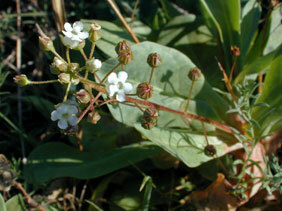 Also Called: Limewater brookweed, limerock brookweed. Stems: Ascending or reclining, solitary or tufted, simple to usually sparingly branched. Leaves: In basal rosette and mostly opposite on stem, simple, egg-shaped to oblanceolate to broadly spoon-shaped, to 6 inches long, and 2.4 inches wide, mostly waxy; margins entire; tips truncate or with sharp, short, abrupt point. Flowers: Stalk slender, wiry, spreading or ascending, .4 to 1.2 inches long; calyx bell-shaped, 5-lobed; lobes triangular to oblong-ovate, glandular at base, often purplish, tips pointed; corolla 1/6 to 1/4 inch wide, white; lobes 5, egg-shaped, overlapping, shorter than bell-shaped tube, tips truncate or flat, toothed; stamens 5, not projecting beyond corolla. Fruits: Capsule, spherical, 1/6 inch in diameter; seeds numerous, tiny. Habitat: Along streams and rivers, marshes, seepage areas, wet limestone; moist soils. Distribution: South 1/5 of Kansas.